Sunday Nov 4th, week 13 of CIM training, and I am having this “I am not ready yet” panic. Somehow I don’t see this season’s training is producing measurable and significant result — speed-wise; I just don’t feel that I am running any faster than beginning of this year and I missed my target pace on my last week’s 15 miles run. So I started to sweat about not meeting my goal at CIM. I researched about how to mentally prepare myself for this race, since I don’t think there is room for me to improve physically. I told Max about my attempt to get mentally faster, and he laughed and told me just to relax. Well, easy for him to say. Entering November, lots of stress from work since we have number to catch up in Q4. I can’t sleep well because of the cold and rain, and for the last few days I was having fever; needless to say that I worry about my health condition also. And I have gained few pounds in Oct, I was thinking about to lose those extra weight in the next couple weeks. I also am feeling a little blue because I miss my mental support while that person is on vacation in beautiful faraway places. Of course the gloomy fall weather in Bay Area doesn’t help either. All these added up stress really drained my energy. A week before I had lost my training momentum, but with all the morale support from my running friends I was able to pick up my desire and drive to continue and moved on again. I am not an inexperienced runner when it comes to preparation for marathon races, but all these worries that I have encountered this season are quite new to me. I remember how nervous I was the night before my very first race, and how I had relied on my iPod for hours of music while lying still in bed with eyes closed waiting for Start time. But now the anxiety comes month before the race, and all I worry about is missing my target. Having a goal embedded into training somehow stressed me out. 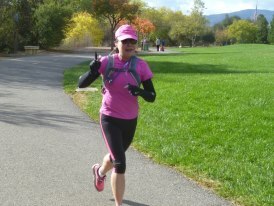 Sat Nov 10th, my last 20 miles long run, and for the very first time I actually wanted to have someone to run with; I needed extra strength from another runner. Stan, who has done CIM before but hasn’t run much long distance for a while due to injury, found me a running partner who is also training for CIM. So Masa and I agreed to meet up at Campbell at 6:30am and we would run this 20ml long run together. Stan also showed up to run the first 5 miles with us, and I really appreciate that buddy support. It’s a very cold morning and the three of us did our warm-up miles together at an easier and comfortable 10:00 pace. Stan was telling me his CIM experience, course description, and repeat lectures of “not to go out too fast!” And the last tip on “men and women finish in different chutes, so don’t run to the wrong side at finish line.” Stan and I have met years ago when I trained for my first Nike Women’s Half Marathon, and he has always provided me sound advice whenever necessary. He kept telling me that he saw me progressed and improved so much in a year; I am not sure if I am really getting that good but appreciate his encouragement nevertheless. Masa picked up his pace and took off around mile 6, and I just wanted to stick to my pace and ran my last long run without pushing too much. I never know how to run through aid-stations, so today I actually stopped and sipped water from my Camelbak . All these short breaks should be calculated into my time since race clock doesn’t stop ticking till you cross the finish line, does it? I ran into couple old friends as I continued toward the reservoir, and stopped at John’s bench to let him know my training is almost coming to an end, and probably won’t stop to see and talk to him for a while. Mile 13.5, I reached Los Gatos High School track and I stopped for a brief break for water and gel, and thinking this turned out to be another solo long run again because I never seen Masa again when we split after mile 6. But I am fine with that. I turned around and started retrieve my footsteps, surprisingly I saw Stan standing by mile 16.5 and waving at me with a bottle of water and different flavors of GU Gel. “What you want? Orange, Vanilla, Chocolate..” wow, VIP treatment!! I felt like million bucks!! I grabbed the orange flavor and found it tasted so yummy!! Or maybe it’s all mental:-) Thank you Stan for standing and waiting, that’s totally unexpected and really awesome!! I ran back at faster pace, but knew that I was behind my target pace. Does that mean I am going to fail the secret goal I have had in head for CIM? “Don’t go there Michele. Don’t overstress yourself with numbers.” I tried to get rid of the negative thoughts and focused on finishing this 20 miles today. I came near that little hut and saw Lori, Terry, Stan clapping and cheering when I getting close; Stand took couple pictures of me and saying “yes, you did it – 20 miles.” But I did not stop, I motioned my index finger as indication of “not yet, need a little bit” I turned right onto the wooden bridge and ran till I hit the 20 miles mark. Woohoo~~ taper begins now! I got a text message from Casey and asking if I would be doing coffee at Orchard, so I told him yes and invited Stan and Venkat to have coffee with me. I always like to walk to the coffee place as my way to cool down after long run, and the atmosphere of a cozy local coffee shop is always a great spot to hang out with running buddies and chat about running, racing, life, travel, why men and women think differently… etc. Since Casey, Venkat and I are all going to CIM, so naturally we discussed about taper, race logistic and race strategy..etc. Most of us are going to Sacramento on Sat, but Casey will drive up there on Friday and stay till Monday. He doesn’t want any surprises before the race, and he wants to stay for award ceremony since he is aiming to win. Casey has a lot to say about his trainings and his goals — his 3 goals for every race – PR, Top 100 over-all, Top 3 in Master. Venkat has his goal to PR I knew, and I had a goal when started this 16 weeks training as well. Stan and I had actually discussed about my sub-4 marathon goal two days before, and my worry of not able to meet that goal. He sent me a VDOT link and predicted that my time would be 3:59:53 based on my Half marathon PR at RnR SJ. But this morning he was giving me advice about “Just let the process & your good training happen. Don’t fixate on one time goal — have multiple goals.” Of course the goals he was telling me are very different than Casey’s. “Running a marathon has multiple variables and things have to fall in place for one to run it well. It’s like a box of chocolates. You never know what you’ll get at your goal event.” So don’t worry about the things you can’t control & focus on the things you can control, such as your training, your diet & your attitude. He was telling me he had a great time at CIM, “time” as finish time, racing experience, running with friends… etc. He asked about my best PR, and that made me thinking about Tokyo Marathon – how I ran it and how much I enjoyed it! That 4:08 PR was a bonus I would say. I was so looking forward to my run in Tokyo during the trainings, and everything was fun and exciting about the race and the trip. Seeing Totoro with Max the day before the race was like getting extra dosage of adrenaline, and the race day just turned out to be one gigantic happy day that everything went right for me. So I think some people run with effort, some run with technicality, and some run with feelings — like me. So stop counting hours and days, just let taper begins and Run Happy! !